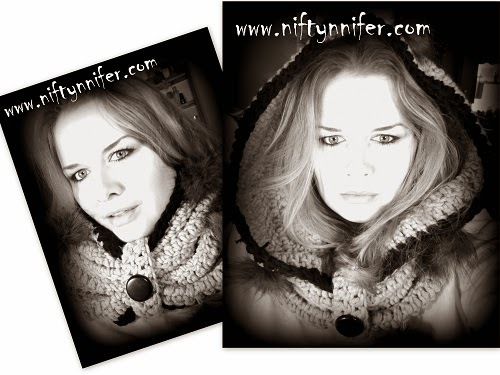 This lovely cowl can also be worn as a hood, keeping the cold wind out of your face and ears. The even more amazing thing is how Easy it is to make! To better understand my crochet abbreviations, please click Here. 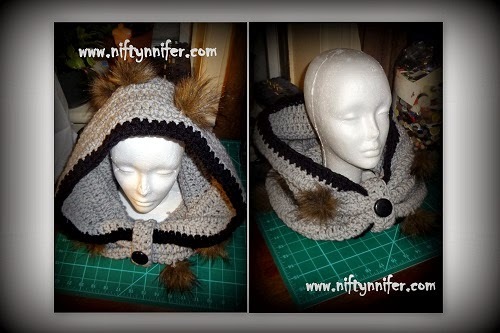 Size may vary by each individuals crochet tention! Hide all knots and ends inside! 8 dc = 4 inches. 5 rows = 4 inches. Ch 70, ss in beg ch to join, ch 3, turn. Dc in ea st around. Ss in top of beg ch 3 to join, ch 3, turn. Dc in ea st around. Ss in top of beg ch 3 to join, ch 3, turn. Dc in ea st around. Ss to join in top of beg ch 3. Fasten off. Ss to join new yarn. Ch 3, dc in ea st around. Ss in top of beg ch 3 to join. Fasten off. Ch 19, dc in 3rd ch from hook, dc in ea st across. Ch 3, turn. Dc in ea st across. Fasten off leaving tail. Add a few stitches to hold it in place. Add a Button or another amazing embellishment!